Grindstones – Both borazon and grit stones. Popular sizes of borazon stones are kept in stock for Perini, MTC and PCMC Machines. Knife Holders – We hold in stock both pneumatic and manual knife holders and most of the spare parts used in them. For pneumatic knife holders of the crush cutter type we offer a full refurbishment and repair service. 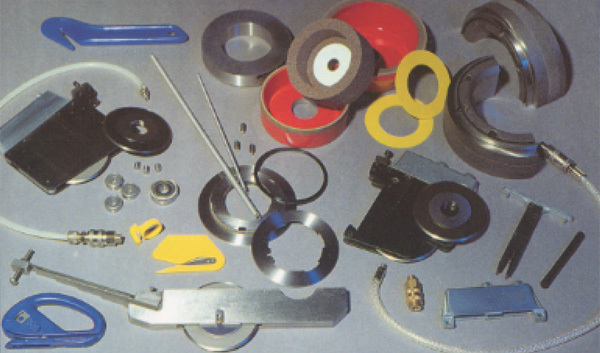 We Also Supply – Band Saw Blades, Cutting Sticks, Doctor Blades, Hardened Sleeves, Spacers, Tungsten Tipped Carbide Circular Saws, PLY Bonding Wheels, Pins, Bearings and Extension / Garter Springs.